GENN, Leo (1905-1978). A large archive of material collected by Leo Genn, all concerning the investigation and prosecution of war criminals at the Nuremberg Trials in 1945-1946. 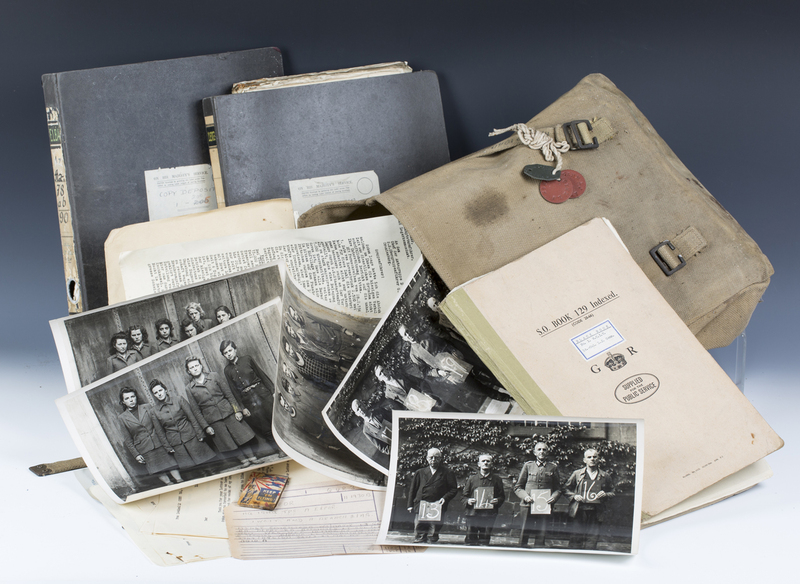 The archive comprises Genn's original copies of the signed witness and prisoner statements, photographic evidence and images of the defendants, case files and other evidence. The majority focuses on Belsen and Auschwitz concentration camps, including statements and photographs of the defendants Irma Grese, Hilde Lohbauer, Karl Schmitt, Walte Steuer, Franz Harich, Jonas Levi and Willy Jong and others. Also included are Leo Genn's identity tags and an army-issue canvas bag, in which the archive was discovered. Note: Leo Genn studied law at Cambridge and was a qualified barrister, but he also enjoyed a successful career in film and theatre. He volunteered his legal knowledge to the British Army unit involved in the investigation and prosecution of Nazi war crimes perpetrated at the Belsen concentration camp, and subsequently became an assistant prosecutor at the Nuremberg Trials.